I picked up this anthology solely because I saw Ilona Andrews had a story in it. Charlaine Harris also usually writes decent short stories, but not always. But I figured, I like everything I’ve read by Ilona Andrews, and there should be at least one other decent story in there, so it’s worth it. The final story, “Blind Spot” by Miljean Brook, I liked, though not as well as “Magic Mourns.” Maggie has been sent by her boss to “rescue” Geoff Blake, who had been attempting to rescue his sister, but had instead been caught by the demon who had kidnapped his sister. The world building was good in this story, which is good because the characters and their abilities are complex. Although I have to admit that Sir Pup is my favorite of the lot of them. The story is interesting, as is the discovery of the different characters and their pasts. I looked up some of her other books, and their listed as paranormal romances, so although I enjoyed “Blind Spot” very much, I’m not sure about reading a romance series–with boinking. We’ll see. So, this was the first full book I read on the Nook. I love Ilona Andrews and also really like Jeaniene Frost, so I figured I couldn’t go too wrong for three bucks. 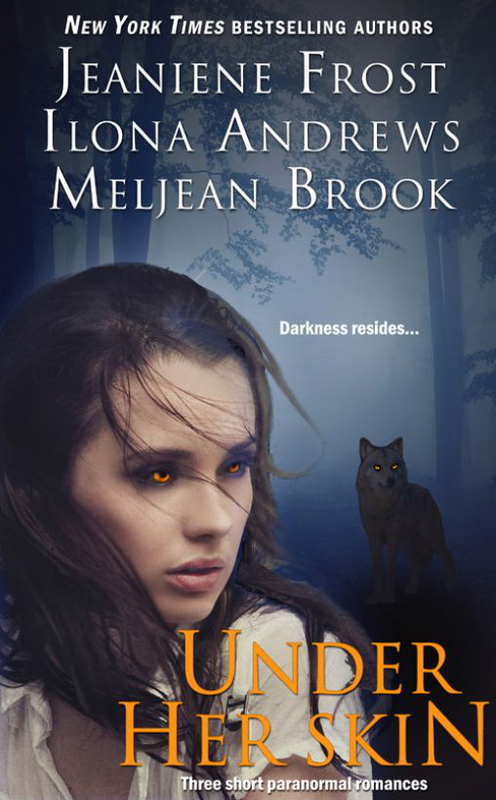 These are three short paranormal romances, focusing on shape shifters, but also with strong female leads. The second story is “In Sheep’s Clothing” by Meljean Brook. Emma is attacked driving through a storm on the way to her aunt’s house. When her friend and rescuer–the local sheriff arrives–she seems unharmed but understandably shaken up by the attack. This story and the first focus on the time right after a mere mortal is bitten by a were and the changes that manifest almost immediately. What I particularly liked was that Emma was NOT too stupid to live, but instead did everything she could to save herself. I like heroines like that. There were other things like liked about the story (hard to talk too much about a short story without giving everything away) but over all, it was for me the weakest story in the collection. This was also the only story that had boinking. Are those two facts related? Probably. Yes, these are three relatively short stories, but the stories by Jeaniene Frost and Ilona Andrews were definitely worth the price of admission. Only drawback about these stories is you can only get them in ebook format.